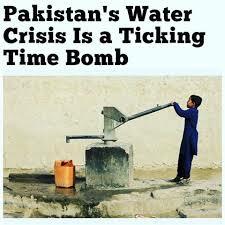 Official projections show that Pakistan – whose population has increased five-fold since 1960 to some 207 million, will run dry by 2025 when it will be facing an “absolute scarcity” of water with less than 500 cubic meters available per person in Pakistan. The crisis is looming. In all urban areas, the water table is going down day by day, warns Muhammad Ashraf, chairman of the Pakistan Council of Research in Water Resources. “Water is the number one problem for the country,” says professor Javed Akram, vice chancellor at the Pakistan Institute of Medical Sciences in Islamabad. Not only scarce it is contaminated also. More than two-thirds of households drink bacterially contaminated water and, every year, 53,000 Pakistani children die of diarrhea after drinking it, says UNICEF. Cases of typhoid, cholera, dysentery, and hepatitis are rampant. According to the UN and Pakistani authorities, between 30 and 40 percent of diseases and deaths nationwide are linked to poor water quality. In Lahore, Pakistan’s second largest city, the situation is even worse than in Islamabad. The Ravi River which supplies the city’s 11 million or so inhabitants with drinking water also serves as a spillway to hundreds of factories upstream. River fish are eaten by locals, but “some papers show that in the fishbones, some heavy metal contamination (is) found,” says Sohail Ali Naqvi, a project officer with the conservation group WWF. The Ravi is also used to irrigate neighboring crops, which are themselves rich in pesticides, warns Lahore environmentalist Ahmad Rafay Alam. In Karachi, a megacity whose population could be as many as 20 million people, mafias fill the vacuum left by the creaking local network, selling the precious water they bring in by tanker trucks at high prices. There will be soon No water available & the climate is so bad that Pakistan is amongst the worst countries but guess what? All we care abt is the ban of #VeereDiWedding ?? Lack of political vision & will to counter the ‘Absolute scarcity’. The lack of water infrastructure is glaring. In a country where the “environment is not part of the political agenda”, there are “nearly no treatment plants”, warns Imran Khalid, a researcher at the Sustainable Development Policy Institute. Pumps draw deeper and deeper into the water table, where the arsenic content is naturally higher, he warns. An international study in August said some 50 to 60 million Pakistanis are slowly poisoning themselves with arsenic-tainted water. Nearly 70% of Pakistan’s 291 millimeters of annual rainwater gets wasted because of poor storage facilities and accumulation of silt in the country’s water reservoirs, said Qamar uz Zaman Choudhary, former director-general of the Pakistan Meteorological Department. Pakistan is approaching the scarcity threshold for water. What is even more disturbing is that groundwater supplies are being rapidly depleted. And worst of all is that the authorities have given no indication that they plan to do anything about any of this,” Michael Kugelman, South Asia expert at the Washington-based Woodrow Wilson Center, told DW in a 2015 interview. Water scarcity is also triggering security conflicts in the country. Experts say the economic impact of the water crisis is immense, and the people are fighting for resources. Three out of four Pakistani provinces blame the most populous and politically empowered province, Punjab, for usurping their water sources. “The government is ignoring the interests of our province,” says Ayaz Lateef Palejo, a nationalist leader from the southern Sindh province. There is massive corruption in the water sector, and we are unhappy with the situation,” he added. There are three major reasons. One is bad water management. Existing resources simply aren’t used very judiciously. Because people generally don’t have to pay for water, there is no incentive to use it sparingly. This is why farmers flood their fields with irrigation water, and urban industries consume well more than they need. Also, water infrastructure is in bad shape, leading to leaky canals and dams. The second reason for the crisis is population growth. As the population has risen rapidly, demand cannot be met. And the third, more recent, the reason is climate change. Himalayan glaciers, which feed much of Pakistan’s water supply, are melting rapidly. This leaves much less water on the whole. Riverbeds are drying up across the country. Put together, you have immense demand, aggressive consumption, and inefficient use. The result is intense water stress. Already affecting the lives of millions of Pakistanis? Water is the life force of humanity, and so everyone suffers when it becomes so scarce. In a poor country like Pakistan, many cannot turn to bottled water as an alternative. Also, farmers – one of the top sources of employment in Pakistan are running out of irrigation water and having their livelihoods imperiled. The issue of water pollution further worsens this problem for Pakistan. The sources for water pollution include the overuse of chemical fertilizers, the dumping of industrial wastes into lakes and rivers, untreated sewage being dumped into the ocean, and contaminated pipelines being used to transport water. The contamination of fresh drinking water makes it harder for people to find clean water supplies and increases the prevalence of waterborne diseases. Consequently, most of the reported health problems in Pakistan are either a direct or indirect result of polluted water. The economic implications are clear, you can’t have a sustainable economy if it doesn’t have enough water to power it. Pakistan runs on an agrarian economy which is deeply imperiled by water loss. It is imperative that Pakistan makes water management a priority. Failure to do so would jeopardize the country’s national security. Pakistan’s leaders and stakeholders need to declare their intention to tackle it. Simply blaming previous governments, or blaming India, for the crisis won’t solve anything. The vast majority of Pakistanis probably know that serious environmental damage caused by flooding and heavy rainfall is not caused by India. Own government’s inability to foresee, prepare and manage is the reason for this looming threat. Pakistan does more to blame India than it does to construct any sort of domestic capability aimed at managing existing water supplies. India has built thousands of more dams than Pakistan. Politicians are treating a domestic crisis as a foreign policy problem. Pakistan needs to focus on the effects that rapid urbanization, poor urban planning, high youth unemployment, the population bomb and government corruption has on the country’s water problems. It seems that a readjustment of perspective might be a more useful than the blame game.